The 2 GB limit is applicable to PST files of ANSI format. ANSI formatted PST files will be available if and only if the user is still using Outlook 2002/ XP or previous versions. Supports Windows 10 & all the below versions to export MSG files from Outlook. Provide Support for all the Windows versions such as Window 10, Windows 8.1, Windows 8, WIndows 7, Windows Vista, Windows XP, etc.to import MSG to Outlook. It is possible to convert hundreds of MSG files saved on your system drive to PST file format at once. You can create single PST file for all the MSG format emails that you have, using MSG to PST file converter. Meanwhile, the software will keep all the Meta properties intact viz; To, Cc, Bcc, date of creation, sender details, etc. To examine MSG files for some sort of data investigation, you can preview them in features view. Before we add .msg file to .pst, each MSG can be viewed in Normal view, Hex View, Property view, message header view, MIME view, HTML view, RTF view and corresponding email attachments. MSG File to PST converter has a Windows Explorer style interface through which MSG file location can be automatically located. To combine msg files to pst, you can directly browse the folder having MSG files and then the software will load all the MSG files along with associated properties, regardless of other files present in the same folder. After viewing MSG files, you can export selective or entire emails into PST format. It is possible to create a PST file from selective MSG files rather than exporting all of them. Simply check or uncheck the emails which you want or do not want to convert and right click on it to export. While we create PST from MSG files, software provides an option to break Outlook PST file size into smaller parts. So, instead of creating a difficult to manage, single large PST file; you can divide the size into multiple parts to make it more manageable. The software loads MSG files with its top attributes like: from, subject, To, sent, Received, and size in KB. Now, if you want to re-order the list of MSG file, then sorting will prove helpful. You can sort the email messages from any of these fields in rising or falling order so that you can selectively import msg files to pst. MSG to Outlook PST Exporter has the user interface much alike MS Outlook. Thus it opens in horizontal view. But if you want to view content in vertical mode then option to switch view mode is available. You can change the screen to vertical, although by default it is horizontal. What makes MSG files to PST file converter unique from others? "Mention some important qualities of this software which makes it distinguishable among the other products"
The tool supports various versions of Outlook such as Outlook 2016, 2013, 2010, 2007, 2003, etc. to import the MSG file data into PST File format. No, Software does not enforce a size limitation on MSG file. You can convert MSG Files of any size using this software. Can I see HTML View of an email? Yes, you can avail HTML view of the emails using this utility. The software also offers Hex View, Properties View, MIME View, RTF View, etc. Will the software support Windows 10 platform for converting .msg files to .pst? "I have Windows 10 OS configured in my computer and I am looking forward to convert several of my MSG files into PST format. Can I use this tool on my machine?" Yes, latest version of the tool now works smoothly with Windows 10 Operating System and below versions as well. How many MSG files can I convert at a time? "I have 100+ MSG files on my system. Can I bulk import msg files into pst or do I have to convert each one at a time?" Yes, you can convert single as well as multiple MSG files at once. For converting multiple MSG files you just need to create a folder containing all the MSG files. Software will detect that folder automatically in its explorer panel which can then be converted desirably. Do I need to have Outlook Installed on my machine to perform conversion? No, software can perform conversion even without Outlook installation. But, further if you want to see converted PST file, Outlook environment is a must. Will the software also convert attachments of emails? Will I be able to convert multiple folders of MSG files in one go? "I have several MSG files in different folders. Can I convert those folders simultaneously using this software?" Yes, you can export multiple folders containing MSG files in one go using .msg file to pst Converter. The tool will copy msg files into pst with respect to the folder hierarchy. For those who search for a solution regarding the "how to import MSG to Outlook" query, I can suggest MSG Converter which can safely import all your MSG emails to PST without causing any harm to your important data or even the meta-data. I say this from my experience of working with the MSG 2 PST converter. It is really worth trying. Thanks a lot! 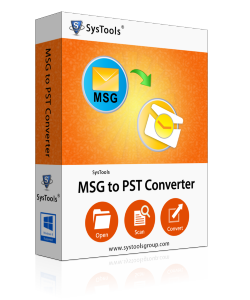 SysTools MSG conversion utility is the simplest tool I have ever used. Overall, speaking specifically about the MSG conversion tool, I would like to add that the software will perfectly fit for the scenario in which you need a consolidated PST file corresponding to large number of MSG files. Being not a professional, it was an ecstatic moment when I could import MSG files into Outlook PST using .msg file to PST converter without seeking help from an expert. Thank you SysTools team for bringing out user friendly utilities. It is rather a tough decision to choose from the numerous softwares available today. But since I've used SysTools products before, it was not at all difficult for me to choose MSG to Outlook PST Converter.